I'm trying to finalise good hard-filtering parameters. 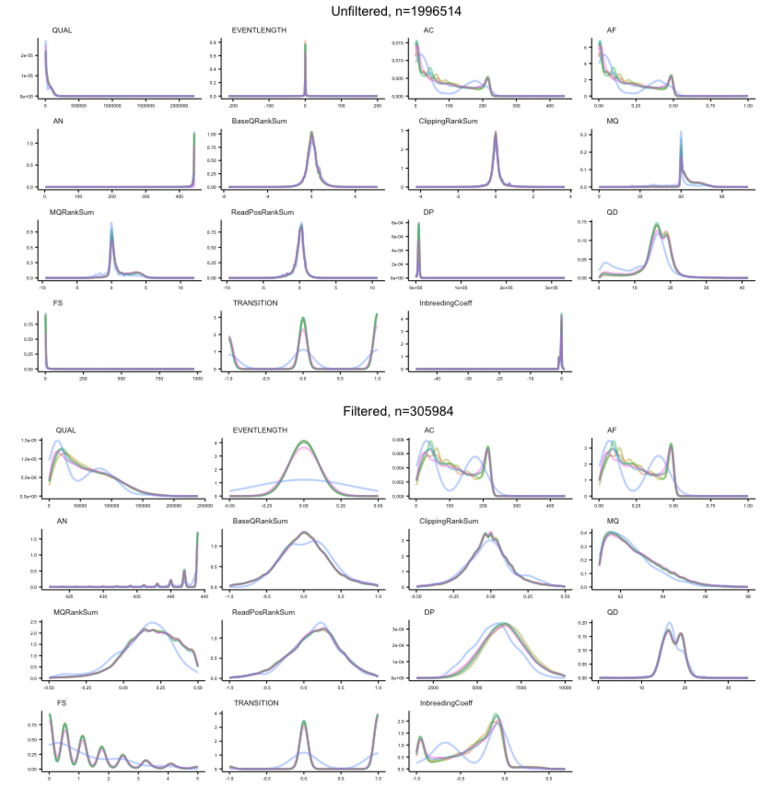 Does anyone know why the quality-by-depth distribution having has two peaks (See attached graphs, last column"QD"). (MQ > 61, MQ < 68, FS < 5, AN > 420, InbreedingCoeff > -1, DP < 10000, DP > 1000, ReadPosRankSum > -1, ReadPosRankSum < 1, ClippingRankSum > -.5, ClippingRankSum < .5, BaseQRankSum > -1, BaseQRankSum < 1, MQRankSum > -.5, MQRankSum < .5, EVENTLENGTH < 1, EVENTLENGTH > -1). Hi Will, if I recall correctly this is expected due to a small amount of separation in the profile between HET and HOM-VAR calls. If you plot those separately they should align to the two peaks, respectively. Thanks @Geraldine_VdAuwera If I understand you correctly, one of the peaks should be full of variants which are mostly heterozygous, and the other peak is full of variants that are mostly homozygous. I shall try and plot the quality distribution by heterozygous counts. I feel as though my filtering parameters are very strict as they reduce the number of variants from 2m to 300k. I guess I have to see if these dropped variants are mostly around centromeres or other non-unique sequence to be confident that I'm not throwing out true and accurate ones. What can be helpful if you have a set of known sites is to look at the subset of those sites where you have a variant call in your data, and plot their distribution relative to the overall distribution. That will give you an additional view on how appropriate or not your filters may be (if you're filtering out a lot of the known variants, you're being too strict).